Exporter and importer remain in different countries. Exporter may not be aware of the standing of the issuing bank. In such cases, exporter may insist that the local bank should add confirmation to the credit opened. Normally, importer would not be willing to add confirmation to the credit as it involves additional commission of the confirming bank. 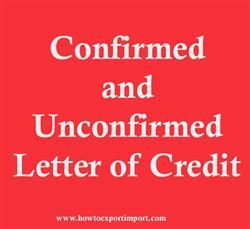 After confirmation, the letter of credit becomes confirmed and irrevocable. Once confirmation is added, the confirming bank, which is normally the correspondent bank of the opening bank, adds a clause to the effect that: "The above credit is confirmed by us and we hereby irrevocably undertake to honour the drafts drawn under this credit on presentation, provided that all the terms and conditions of the credit are duly satisfied". When the credit is irrevocable but not confirmed, the issuing bank asks the correspondent bank to advise the credit and in such a case, the correspondent bank will advise the credit with a clause stating that: "This credit is irrevocable on the part of the issuing bank but is not confirmed by us and therefore it does not involve any undertaking on our part." In the absence of confirmation of credit, there is a contingent risk to the exporter. The exporter has to endorse the documents to the negotiating bank. Though the negotiating bank makes the payment to the exporter, it will have recourse on the exporter in the event it does not get reimbursement from the issuing bank.